I had these nice, brown, free range eggs but alas I had too many. So I decided to use up two dozen in one swoop…or sweep. I boiled the eggs, peeled, and rinsed them in cold water. Then I boiled up two cups vinegar, a cup of water, 4 tablespoons sugar, 2 tablespoons sea salt, and pickling spice. 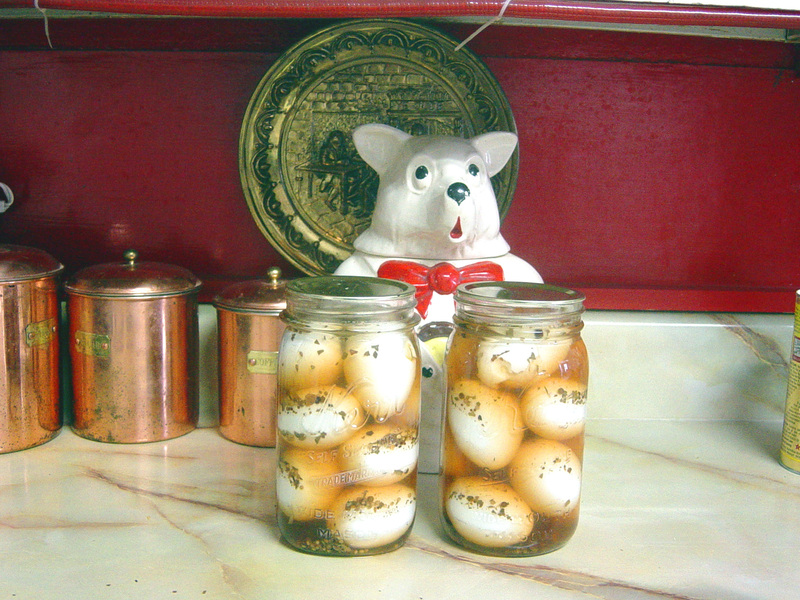 I packed the eggs in two quart jars and poured the vinegar solution over them. I intend to let them sit for two weeks at least before using them in salads. The teddy bear cookie jar belonged to my grandma. Oh, by the way, I used red wine vinegar and apple cider vinegar. You are currently browsing the The Blueberry Tales weblog archives for March 2011.